Heat oil, add cumin seeds, chopped onions and green chillies. Stir-fry till onions are translucent. Add mashed potatoes and the rest of the ingredients. Mix well and take off heat. Rest the mixture for an hour. 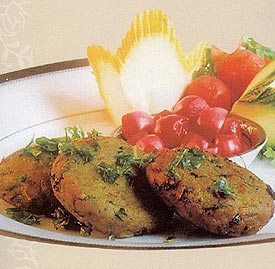 Shape into round patties of 50 gm each using the palm of the hand. Shallow-fry in hot oil to a golden colour. Pat-dry with kitchen paper to remove excess oil. Garnish with chaat masala powder. Serve hot. Nice recipes. Turned out good for me, Prasad ji. very tasty.